Mixology meets High Tea in this set inspired by classic cocktails. Mixology meets High Tea in this set inspired by classic cocktails from around the world. Hand blended by Katie and Dustin Watts, each medley features natural, aromatic botanicals that invoke the signature scents and taste of mojitos (herbal), cosmos (herbal), and Pimm's (black tea based). Steep them as unique, stand-alone teas, or use them as mixers for hot or cold cocktails. Handmade in Atlanta. Katie and Dustin Watts have enjoyed tea since they were kids. The two met in Washington D.C. and discovered a mutual passion for the culture surrounding tea on their first date. Over time, Katie started blending tea and Dustin was often found cooking with unique spice blends. 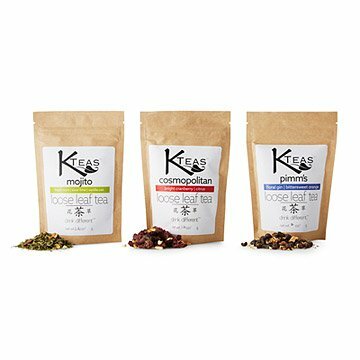 Now, they make healthy, tasty products that take cues from the American cocktail, Asia’s ancient tea tradition, and European cafes and spirits. Katie and Dustin believe that nature knows best when it comes to flavor, digging deep into the botanical world for ingredients. Brew one heaping teaspoon per cup of hot water. Approximately 20 cups of tea per bag. My sister is pregnant and has been drinking lots of tea. She was looking for a new flavor. She loved it! This was a gift for my grandson's partner and sent directly to the recipient. However, he was thrilled and really excited about trying the different versions and sharing with others (Maybe, he said!). Contacted me as soon as he got home from work and could not wait to brew a cup. Go ahead - have a drink - of KTea's! The teas are wonderful and help me to relax after a long day's work. I like the flavors of cosmopolitan, mojito, and gin so I can "have a drink" without the added calories of alcohol. Delicious! Festive without the alcohol! These teas were all super delicious. Wasn't sure at first how they would taste, but surprisingly, very yummy!! What a fun idea! The directions are clear on the packaging. Yummy teas.